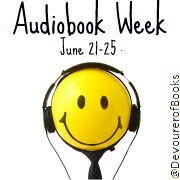 « Other Audiobook Week Discussions! I’m trying to find a better way to review audiobooks, too! For starters, I’m including the narrator’s name on my posts – for some reason, I hadn’t thought to do that before! I write my reviews in the same way as my print reviews but I add a paragraph on the end that discusses the audio production. Those of us who listen to books want to know about the narrator and the production quality, even if it’s just a couple of sentences. I save the audio paragraph for the end, because that fits my review format. I think it is really important to mention you’re reviewing an audiobook — there are so many elements that make or break the book on audio versus when you read it. Sometimes you can sell the audio in a way you can’t sell the book….usually on the narrator or production. I like the format you came up with. It’s sort of a nice compromise, as you review the book itself (the quality of the text) versus the audio production. Best of both worlds. Ditto on what Beth said. My issues, that you will see in my post, is that I don’t take notes, so everything I say is more from the heart than quotes and facts. Great discussion! I keep a journal of audiobook reviews and comments. My entries get fairly elaborate with ancillary material (related illustrations, links, movies, even recipes!) but I have to be very careful about sharing or posting because I work for an audiobook publisher. It’s not enough to state that any opinions expressed are my own and not that of my employer as I have a personal and/or professional relationship with many of the players. I was looking over my journal this morning though and I’ve noticed a distinct change in style; early entries were very pretentious, catering to my literary vanity. I clearly was in love with words and phrases like “exposition,” “basic linear narrative,” and “zeitgeist!” I avoided the use of the word “I” and repeating the same adjective or adverb in the same review. But now, I actually respond more from the heart. How does this title resonate with me and why? What is my personal connection with this book? Why would I want you to read or listen to this title? At the top of each entry, I post the title, author, narrator and cover art. If the review doesn’t integrate the audio components from the book, I make brief notes about the production at the end. Thanks for posting this! I don’t think I hardly ever point out in my reviews whether it was an audiobook, ebook, or book except when I think the audio part makes me like it more (aka I think I enjoyed Eat, Pray, Love and Committed on Audio much more than I would have reading the books because Elizabeth read them and you could hear her emotion). This is a good post that will make me think about making an effort to review the audio part too! It can be harder to write an audio book review because you don’t have passages to quote. I’ve had to look at publishers’ websites to find out how to spell words to write reviews before. I have always found reviewing audiobooks to be a bit tricky. Either I like the narrator, or I don’t–most of the time if I don’t I just get the book and read it rather than listening. Sometimes I am so enveloped in the story, I don’t even notice the narrator unless they really make a mistake. Thanks for tackling this topic. It has been something I have been pondering lately too. I like to know that it’s a review of an audiobook right away. Apart from that, I like your idea of four sections. I think that even though it’s a review of an audiobook, synopsis and thoughts on the story deserve to come before the audio experience. I agree – this way you can skip to the content you are looking for. I’m pretty much the same as Melissa. Though, I don’t care how good a book is, generally it can’t recover from a bad narrator. I’m also someone who easily gets annoyed by voices too, so even if the narrator does a great job, if I can’t stand their voice, I have to abandon it and try reading it later. When I review book I mention that the book is an audio book and sometimes share if the book impacted my reading experience. Usually it doesn’t impact my enjoyment of a book – I hate to admit this but I tend to like listening to book narrated by women more than men (most of the time). For reviews I just three 3-5 sentences about the book and that’s it. I have found that so many people just want to know if a book is worth reading. I like your ideas on a new format. I’m also playing with how to handle audiobook reviews on my blog. In general, I’m not picky about narrators, so I haven’t tended to mention them often, but I’m thinking I should. I usually just review “the book” occasionally I will mention something about the narration and when I do its because it was really good or really bad. I will have to try harder from now on because I’d also like to keep better track of wich narrators I’ve enjoyed and which ones I haven’t. Even though at some point in the review, it would become apparent, I think it’s good to let the reader know up front that you’re reviewing an audiobook. I have yet to write my first audiobook review. There’s a lot of good discussion here — things for me to consider. As far as differentiating between problems with the work of the author and problems with the work of the narrator — you might want to create a section for that as well. This would give the reader the opportunity to compare and contrast the two. Oh, I just left my Linky. I have a tendency to write really short reviews when I do audio book reviews. I have a harder time during a summary since I don’t usually take very many notes while I’m reading and I don’t have any quotes. But I do try to get something up.